Create a carbon dioxide–rich atmosphere in a cup and watch how it changes the water beneath it. This model of ocean-atmosphere interaction shows how carbon dioxide gas diffuses into water, causing the water to become more acidic. Ocean acidification is a change that can have big consequences. 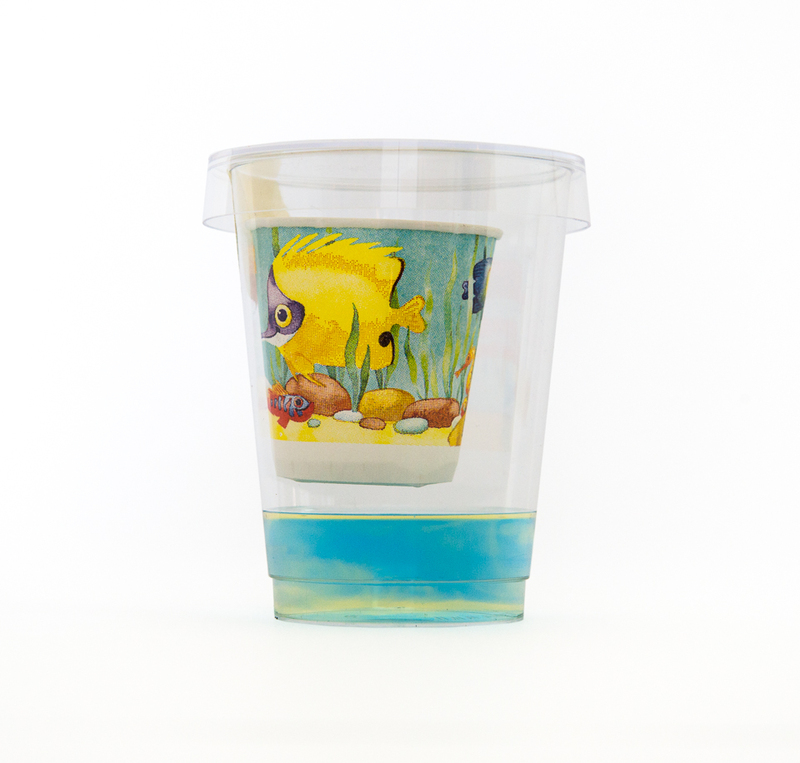 Pour 1 1/2 fluid ounces (40–50 mL) of acid-base indicator solution into each of the two clear plastic cups. Add 1/2 teaspoon (2 grams) of baking soda to the paper cup. Tape the paper cup inside one of the clear plastic cups containing the indicator solution so that the top of the paper cup is about 1/2 inch (roughly 1 centimeter) below the top of the plastic cup. Make sure the bottom of the paper cup is not touching the surface of the liquid in the plastic cup—you don’t want the paper cut to get wet. The second plastic cup containing indicator solution will be your control. Place both clear plastic cups onto a sheet of white paper and arrange another piece of white paper behind the cups as a backdrop (this makes it easier to see the change). Carefully add 1 teaspoon (about 5-6 mL) of white vinegar to the paper cup containing the baking soda (image below). Be very careful not to spill any vinegar into the indicator solution. Immediately place a Petri dish over the top of each plastic cup. Position yourself so you are at eye level with the surface of the indicator solution and look closely. What do you see? Where is the color change taking place? After a few minutes have passed, you should notice a distinct color change at the surface of the liquid. As you continue to observe the reaction taking place, the liquid in other parts of the cup will also begin to change color. This activity illustrates how the diffusion of a gas into a liquid can cause ocean acidification. It also models part of the short-term carbon cycle—specifically the interaction between our atmosphere and the ocean’s surface. Carbonic acid dissociates into H+ and HCO3-. The increase in H+ causes the solution to become more acidic. Carbonic acid is a weak acid. Even so, the presence of this acid affects the pH of the solution. 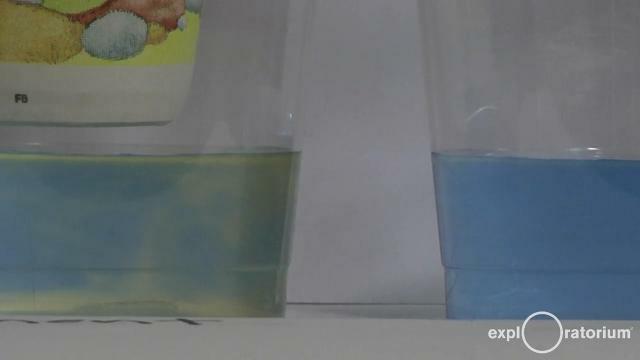 Thus, after a short time, the surface of the indicator solution changes color: from blue to yellow if you’re using bromothymol blue or from purple to pale pink if you’re using cabbage-juice indicator. This color change indicates a pH change caused by the diffusion of CO2 gas into the liquid. 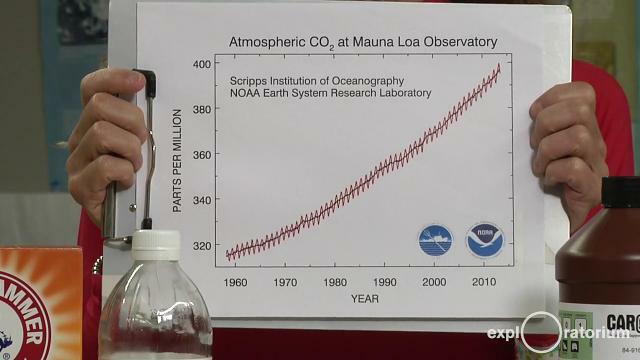 Outside of your paper cup, on a much larger scale, atmospheric CO2 diffuses into the oceans.¹ Oceans are the primary regulator of atmospheric CO2. Human activities such as burning fossil fuels and changes in land use have increased the amount of carbon dioxide (CO2) in the atmosphere from 540 gigatons of carbon (Gt C) in pre-industrial times to 800 Gt C in 2015. Current atmospheric CO2 levels are greater than they have been in 800,000 years, and as a result, the fast carbon cycle is no longer in balance. From 1860 to 2009, the oceans absorbed an additional 150 Gt C from the atmosphere. Diffusion goes both ways—from the atmosphere into a liquid and from a liquid into the atmosphere. This experiment shows passive diffusion: the CO2 gas diffuses into the liquid. What experiment might you try in order to show that diffusion also goes the other way—from a liquid back into the atmosphere? In March 2015, the global monthly average of the atmospheric concentration of CO2 was around 400 parts per million (ppm), or 0.04%. It is a small amount, but it is increasing by more than 2 ppm every year due to the combustion of fossil fuels such as oil, gasoline, natural gas, and coal, as well as land-use changes such as deforestation. Increases in the concentration of atmospheric CO2 have led to increases in the concentration of CO2 and other carbon-containing molecules in seawater. The CO2 added to seawater reacts with the water molecules to form carbonic acid in a process known as ocean acidification. The oceans are absorbing about 25% of the CO2 we release into the atmosphere each year. Additionally, as more CO2 gas enters the atmosphere, the atmosphere gets warmer, causing global temperatures to rise. Ocean acidification is expected to impact ocean species to varying degrees. Photosynthetic algae and seagrasses may benefit from higher CO2 conditions in the ocean, as they require CO2 to live (just like plants on land). On the other hand, studies have shown that a more acidic ocean environment has a dramatic effect on some calcifying species including oysters, shellfish, clams, sea urchins, shallow water corals, deep sea corals, and calcareous plankton. When shelled organisms are at risk, the entire food web may also be at risk. Prior to trying Ocean Acidification in a Cup, learners should be familiar with acid-base indicators and know that baking soda and vinegar create CO2 gas when mixed. 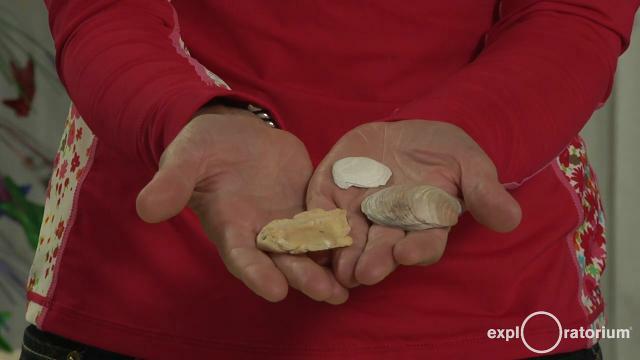 This lesson dovetails with lessons on surface interactions and diffusion. 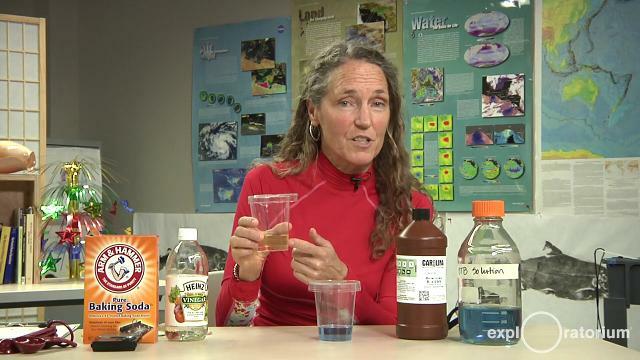 If bromothymol blue indicator is hard to come by, or if you’d prefer not to use this chemical in your classroom, you can use cabbage-juice indicator instead. It’s easy to make: Just take a quarter of a head of purple cabbage, place it in a blender with water to cover, and blend until you get a uniform puree. Strain the resulting mixture—the purple liquid you’re left with is your cabbage-juice indicator. Dilute it with some water and proceed with the experiment, using it instead of bromothymol blue. You will need to experiment with the ratio of water to cabbage juice to see what dilution gives you good results. Note that unlike bromothymol blue, cabbage-juice indicator turns pink, not yellow, in the presence of an acid. Mathez, E. A. (2009). Climate Change: The Science of Global Warming and Our Energy Future. Columbia University Press, New York. NOAA Ocean Acidification Program: What is Ocean Acidification (OA)? NOAA PMEL Carbon Program: What is Ocean Acidification? Thanks to Chris Sabine of NOAA’s Pacific Marine Environmental Lab and to Jim Bishop of University of California at Berkeley for sharing their expertise.